The basic targets of education provided in Irmak Schools are to provide our students with such opportunities which would help them become aware of their individual abilities and develop them, teach students how to relate their experiences and observations acquired in school settings to the facts of life, ensure students’ acquisition of such knowledge, skills, attitudes and conduct they would need in the democratic social life, ensure that they are aware of existence of and respect other beliefs, values and thoughts and develop their skills for creativeness and critical thinking. Such targets also include: to make contributions to our students’ intellectual accumulations by giving education a national and universal identity in today’s world where sciences and technology rapidly advance and raise them as individuals who are capable of following national and international agendas as well as scientific and technological advances and conveniently expressing themselves on international platforms. The PYB, namely the Program for Initial Years of IB Organization, is implemented for our Pre-School and Primary School students. The PYB aims at raising qualified individuals, who respect life, use the language in an effective manner, pay particular attention to aesthetics, base learning on an extra disciplinary framework, understand groups and institutions, pay utmost respect to the world of nature, have full recognition of importance of work, advance under guidance of values and scientific facts and possess the capability of linking their learning in classrooms to the facts of life. We firmly believe that each and every student pursues the purpose of being able to perceive the world clearly and integrally. The PYP directs students to creativeness, inquisitiveness, research and collaborative study. 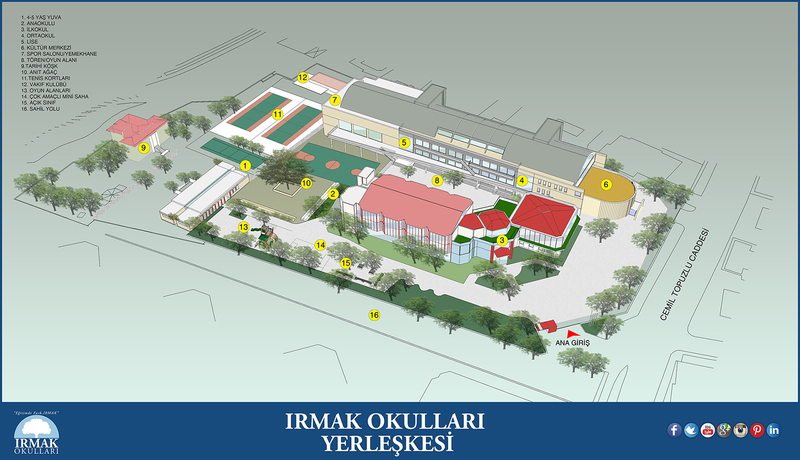 Irmak Schools are accredited to implement the PYP, namely the Preliminary Years Program of the International Baccalaureate Organization, since May 14, 2008. This authorization certifies that Irmak Schools meet such qualifications for an international school providing education to international standards. After having applied to CIS (Council of International Schools), our school received its full membership and became fully affiliated on the January 20, 2001. This page was created on 25.5.2017 15:38:08 and has been visited 3182 times.